Many have asked Soraya where do I start? This book tries to provide information on all manner of resources that can be used both for the new and the experienced witch. Being a Pagan means having respect for every living thing, appreciating the beauty and fragility of Mother Earth and everything on around and related to it. 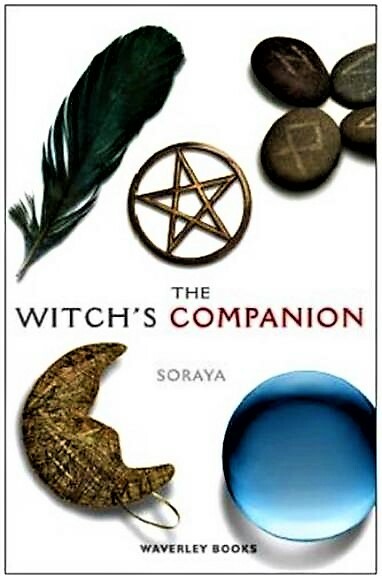 Soraya takes you from the first steps of recognising that you want to follow the Pagan path, to recognising what discipline to follow, and to the intricacies of performing ritual and spells. This comprehensive reference book about the Pagan World includes information on: The Cycles of the Moon, Casting a Circle, Drawing Down the Moon, Spell Casting, Magickal Tools Meditation, Candle Magick, Ritual Verses Initiations, Pagan Festivals, Sabbats, Invoking Rituals Breaking Spells, and much more. A lot of valuable information presented in a clear straight forward way. It is aimed at the novice but has information in there which takes it past the beginners stage, very useful explanations of terms which otherwise can leave the novice daunted. This book is my ESSENTIAL read! I bought it as a complete novice and it's information is invaluable. VERY easy to understand without being 'preachy'. Useful for anyone getting started in witchcraft, Wicca etc but unsure on which path to take. Easy to pick up and just flick to whatever you need to know-doesn't have to be read straight through. HIGHLY recommended. Over the past few years since I finished my “Book of Spells” I have received hundreds of emails from readers telling me how much they enjoyed my book and how easy it was to read. But many emails came from readers asking me the same question “where do I start?” In this book I will try to answer that question and provide information on all manner of resources that can be used both for the new and the experienced witch. I can remember when I first began to follow my path, if I was trying to find a piece of information, more often than not I would have to look at three or four different books. The purpose of this book is to try to provide you with one single book containing information with as much as I can find to help you to find what you are looking for with relative ease. Following the success of JK Rowling’s Harry Potter series it appears that a large number of people adults included believe that being a Pagan is all about creating magick, and casting spells. It’s not. Of course being able to change things by the power of ones will is a desirable side effect but that is not what being a Pagan is about. Following a Wiccan or Pagan path is about knowing yourself inside and out. Following this path is about knowing right from wrong in every aspect of your life. Being a Pagan means having respect for every living thing, appreciating the beauty and fragility of Mother Earth and everything on around and related to it. The earth, wind and sea; the seasons the sun the moon and the stars; they are all important to a Pagan. We don’t take anything that doesn’t belong to us or someone will take from us three times over, we don’t harm anyone or someone will harm us three times over. ii. A Positive Morality in which the individual is responsible for the discovery and development of their true nature in harmony with the outer world and community. This is often expressed as “Do what you will, as long as it harms none”. iii. Recognition of the Divine, which transcends gender, acknowledging both the female and male aspect of the Deity. The first thing that we need to establish is what kind of Pagan are you, what disciple do you or will you follow. There are many different practices to suit different tastes interests and life styles. Some people work within a coven and other work alone as solitaries. A Coven is made up of a group (usually thirteen) people who meet on a regular basis to celebrate Pagan festivals or for the purpose of simply getting together to learn and share. The Coven would comprise of men and women who would be known as priests and priestess’s and they would be led by High Priest and a High Priestess. Some people begin to follow the Wiccan or Pagan path as a solitary and continue to practice as a solitary from then on whilst others are invited or look for a coven to join. The advantage of working as a solitary is that you can work and develop at your own pace. The disadvantage is that being a solitary is quiet an isolating occupation. Today though we are blessed with the internet giving us the opportunity to network and speak to like minded people even though we still carry out our rituals alone. Joining a coven is making a commitment to more than the craft it is making a commitment to the High Priestess & High Priest of the coven as well as the other members. Each coven will have its own methods practices and teachings and you will be expected to adhere to these practices and develop through various degrees of initiation. Although I was initiated by the High Priestess of a coven I have mostly practiced my craft as a Solitary. Sometimes I work with others in the physical sense. I also have several online sisters and brothers and we keep in touch with each other by email and occasional phone calls. I suppose you could call that my Cyber Coven. I have from time to performed initiations with novices of the craft who have requested this blessing from me and I have been honoured by their request. I have mostly lived in locations so far out in the countryside that this has largely prevented me from being part of a working coven in the true sense of the word. A White witch is someone who is generally a healer and who would never use their skills powers or knowledge to harm anyone. They can practice their craft entirely on their own or they can join a coven. I am a white witch and also a Reiki Teaching Master and I consider myself to be a Solitary White Witch. A Green or Hedge Witch more often than not works alone, cares for their environment and generally has a keen interest in natural remedies, particularly those which have been handed down through the years. Hedge witches often clean rubbish that other people leave lying on roadsides picnic areas and beaches. Two of my hedge witch friends do this on a regular basis. That’s not to say that they are they only ones who do this but not everyone who voluntarily cleans up roadside garbage is a witch. I am proud to say that I have come to know and consider as a friend Kit Berry a green or natural witch, writer of The Magus of Stonewylde, Moondance of Stonewylde, and Solstice of Stonewylde. Her contribution shouts in a loud voice all that I believe about being a pagan. This current book hopefully provides everything that you, the reader will require should you wish to perform casual, ritualistic, or full blown ceremonies but remember you need nothing more that a pure heart and a clear intention to honour the Lord and Lady and to say thanks or ask for a blessing.